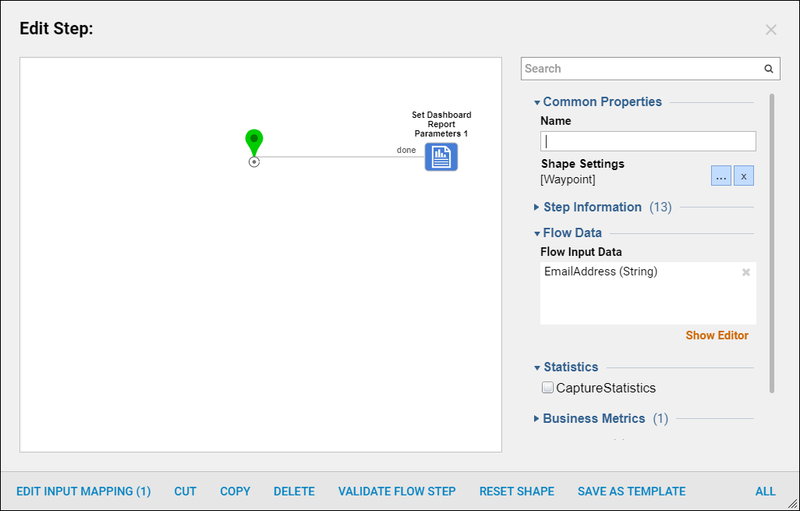 Utilizing a Flow Run Part	on a Dashboard can filter a Report on the same Dashboard. This example will allow users to type in an email address and the report will change and only show the user the Account with that email. Begin by creating a Designer Folder , add at root. Within that Designer Folder, create another folder that will house the Dashboard	for this example. Next in the bottom folder actions panel select, Create Report. This report will take in Account	as the Data Source. Add Email Address	and Account ID	as the Data Fields. Add Email Address Contains	from Filters > Field Filter > Email Address. Within the Properties panel, select Show all data when filter value is empty. Save and Close the report. Back in the Designer Folder select, Create Flow	and name it "Search", within the flow designer, drag and drop a Show Form	step from the Steps	panel. Within the Show Form	dialog, create a new form, name it and select Create,	this will open the form designer. This form only needs a text box, a label for the text box and a button. Configure as following. Save and Close the form designer then save and close the flow designer. Back in the Designer Folder select, Create Flow	and name it "Report Filter", select CREATE. Select the Start	step. Under Flow Data	> Flow Input Data	select Show Editor. Define Email Address	as a String. 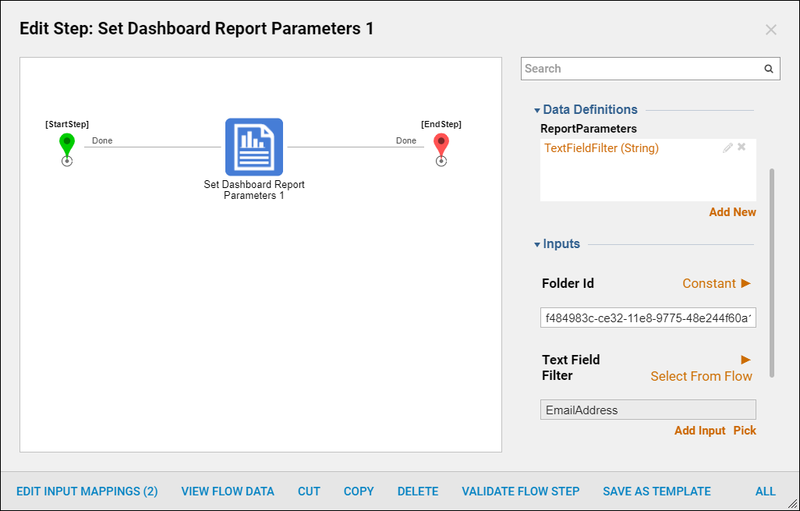 Drag and drop a Set Dashboard Report Parameters	step from the Steps	panel within Integration	>	Reporting	onto the work space. Under Inputs > Folder ID	select Constant. This needs to be the Folder ID of the second Folder created. Back in the Designer Folder, select the folder created to house the dashboard, in the action menu select Manage	>	Get Folder ID,	copy and paste this ID as the Constant	under Folder ID. Under Inputs > Text Field Filter	select Email Address	from flow. Save and Close the Flow Designer. Back in the Designer Folder select, Create Report,	then select Page	and CREATE. Add a Flow Run Part	from the Page Elements	panel to the top of the Page. In the Properties	panel under Flow ID	select the Search Flow	that was created earlier that contained the form. Add a Report Viewer	from the Page Elements	panel to the bottom of the Page. In the Properties panel under Report Setup	> Default Report	select the Report that was created in this example. Save and Close the Page Designer. Navigate to the Folder that the ID was copied from. In the folder actions panel select Manage > Page > Add Page. In the Add Page dialog name the Page, then Pick	the page that was just created. Select OK	to save. Open the folder, the page will show. Type an email address and the report will filter to show the matching email.